Captain Marty Lee: You got any hard suspects? Dave Toschi: Uh, about 90 an hour. I'm up to about 500. We've observed this type of scene countless times in movies. A young couple drives into a vacant area to engage in some amorous activity. Creepy music begins to play and a stranger appears, but we only catch blurry glimpses of him. Without warning, he commits a violent act, ending the lives of our foolish youngsters. Audiences love this type of suspenseful sequence, but they generally expect a certain level of over-the-top silliness to keep the scenes from feeling too real. There is little of that frivolity in David Fincher's Zodiac, an intelligent thriller that uses this standard opening but shifts the genre in a completely different direction. Instead of concentrating on the killer�s identity and motives, the talented filmmaker focuses on the police detectives' and journalists' diligent efforts to solve the case. Fincher (Seven, Fight Club) hasn�t directed a picture since 2002�s Panic Room, and the lengthy break hasn�t softened his ability to get under an audience's skin. Several early sequences involve brutal murders and an unseen killer who attacks without remorse. These scenes are effective, but they represent only a small portion of the clever procedural. In a style reminiscent of All the President�s Men and other '70s classics, Fincher delves into intricate details like handwriting matches that rarely see the light of day in the movies. Working from an excellent script by James Vanderbilt (Basic), he takes his time and follows numerous leads that appear positive but often lead nowhere. Substituting searches through boxes of files for action sequences, this picture makes the quest for information fascinating. Similar to Michael Mann's The Insider, this real-life adaptation generates amazing suspense without resorting to cheap thrills or gimmicks. 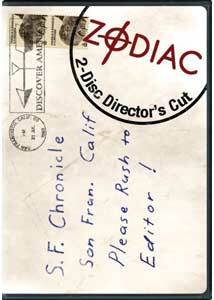 The Zodiac investigation was even more complex because of the heightened coverage of the killings. It became difficult to determine if the same person was even involved in each of the murders and whether the letters and other puzzling communications were authentic. Fincher perfectly captures these complexities by presenting the conflicting views within the police departments and press rooms. As the months progress, Graysmith, Avery and others are worn down by personal pressure to find the true killer, which might be impossible. The film documents their tenacious pursuit and reveals the determination required to even discover a possible suspect. It might lack the visual inventiveness of Fincher's previous work, but it retains his sharp originality and attention to detail. The tone is more adult-oriented and showcases a confident, mature director continuing to stretch his craft. Audio Transfer Review: This disc provides an effective 5.1-channel Dolby Digital track that conveys the sense of dread felt by the Zodiac's victims. The rear speakers contribute to this eerie feeling during several late moments. I would have enjoyed having a DTS option for this special release, but it's hard to complain about this memorable audio transfer. Extras Review: This two-disc Zodiac release does represent a shameless double-dipping tactic, but at least it delivers the goods. The first disc includes an extended cut of the picture, but it only lasts about five minutes longer and has mostly unnoticed changes. A big positive is the inclusion of two commentaries: one from David Fincher and another from a larger team of cast and crew. The director's tone is pretty dry, but he does provide a tremendous amount of information about the creative decisions involved with this ambitious film. The second group even includes crime novelist James Ellroy, who has a wealth of knowledge about the era. He joins James Vanderbilt and producer Brad Fischer for an engaging discussion. Also appearing on this track but in a separate recording are Jake Gyllenhaal and Robert Downey Jr., who have a less-exciting conversation. The centerpiece of the section titled "The Film" is this intriguing documentary covering the major aspects of the production. Available in complete form or in seven parts, this interview-heavy piece offers a wealth of material for film lovers. The first segment covers this movie's origins and the topic�s attraction to Vanderbilt. The lengthiest area involves the San Francisco setting and the sets built to resemble the Chronicle's offices in 1969. A crazy highlight involves a simple car scene where Fincher puts Gyllenhaal through a mind-numbing 36 takes. Another notable event occurs at Lake Berryessa, where Fincher realizes they're not exactly at the murder site. This documentary includes a huge amount of on-set footage and interviews with nearly everyone, but Fincher doesn't participate. In fact, his only direct contribution occurs on the commentary. Even without the director, it's nearly impossible to complain about this exhaustive piece, which never wears out its welcome. I was surprised how many visual effects were used to recreate San Francisco's past. This piece includes great footage that clearly shows the progression from the early computer designs into the finished product. Visual effects supervisors Craig Barron and Eric Barba explain the intricate process and the complexities involved with crafting even the simplest effect. A highlight is the look at water shot of San Francisco, which had to be recreated from many sources to reach the correct appearance. These brief featurettes compare the rough computer-animated previsualizations with the completed scenes. The versions are pretty similar, with the exception of the actors, who show a lot more emotion than the eerie CGI people. The other main section, "The Facts," provides an in-depth look at each murder committed by the Zodiac. The real-life cops and journalists provide great material, but the major draw is the actual victims who survived. Michael Mageau recovered from many gunshot wounds at Blue Rock Springs, but the effect on his speech patterns remains. His statements are pretty odd and are all over the map. Alternately, Bryan Hartnell delivers intelligent details about the violent stabbing at Lake Berryessa. This 36-minute segment is comprised largely of his interview, and it never drags. The final segment involves San Francisco and spotlights numerous inconsistencies between the recollections of two cops. This in-depth exploration of the prime suspect does present evidence implicating him, but its most intriguing figure is Allen's friend Donald Cheney. This creepy guy alerted the police about his pal and seems genuine at first, but some strange coincidences reveal some doubts about his story. In fact, some policemen believe that Cheney was closely involved with Allen's exploits. This feature paints a broad picture and shows the argument for and against his guilt. By the end, there are no clear answers, but the discussion is riveting. After a frustrating bare-bones offering last summer, David Fincher's remarkable Zodiac finally receives the outstanding DVD release that it deserves. The "director's cut" label is a bit misleading and doesn't amount to much, but the intelligent extras earn this two-disc set a strong recommendation. If you missed this underrated gem in the theaters, now is the time to discover a truly compelling procedural.